Senior Congress leader Digvijaya Singh asked the RSS why they are so hostile towards him- a Hindu. 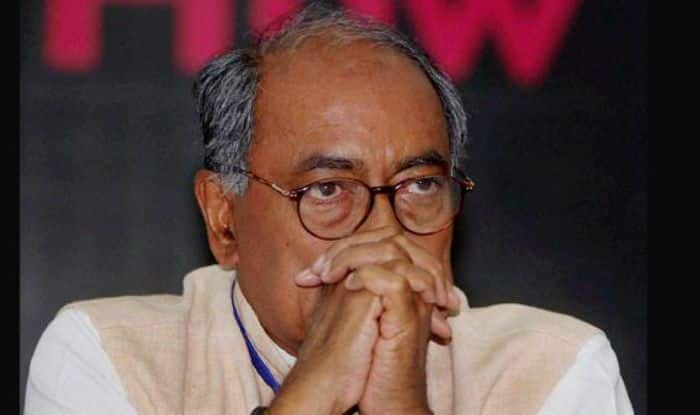 New Delhi: Senior Congress leader Digvijaya Singh on Thursday asked the Rashtriya Swayamsevak Sangh (RSS) to reason their hostility towards him- a Hindu. Singh who will contest the Lok Sabha elections from Bhopal constituency in Madhya Pradesh, said that he is a disciple of Shankaracharya, but does not show off his faith. “I am an anointed disciple of Dwarka and Jyotish PeethShankaracharya Swami SwaroopanandaSaraswati since 1983. Neither I tom-tom my faith from the rooftop nor do I exploit it during elections,” the former Madhya Pradesh chief minister said. “Politics divides, it divides even families. Therefore religion should not be connected to politics,” the Congress leader added. To a question about BJP’s slogan of “Congress-Mukt Bharat” (Congress-free India), he said, “This was the mindset of Hitler…This means no opposition. We are fighting this mindset.” He also quipped that Prime Minister Narendra Modi did not declare his marital status in nomination forms before 2014. The Congress announced its candidates for nine of the 29 Lok Sabha seats in Madhya Pradesh on March 23. Former Minister and Lok Sabha member Kantilal Bhuria was given the ticket to contest on Ratlam (reserved) seat.